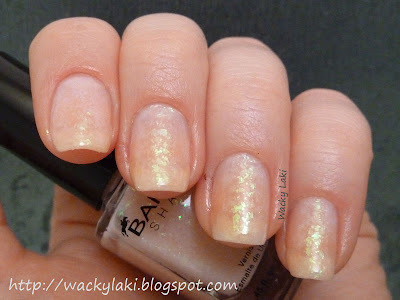 I was really lucky to be sent some amazing polishes by Barielle to play with. One of those polishes is a lovely flakie named Budda-Ful. The name led me to dream of lotus flowers on the corners of each nail. As it often happens, what I think up doesn't quite come out as I pictured it. 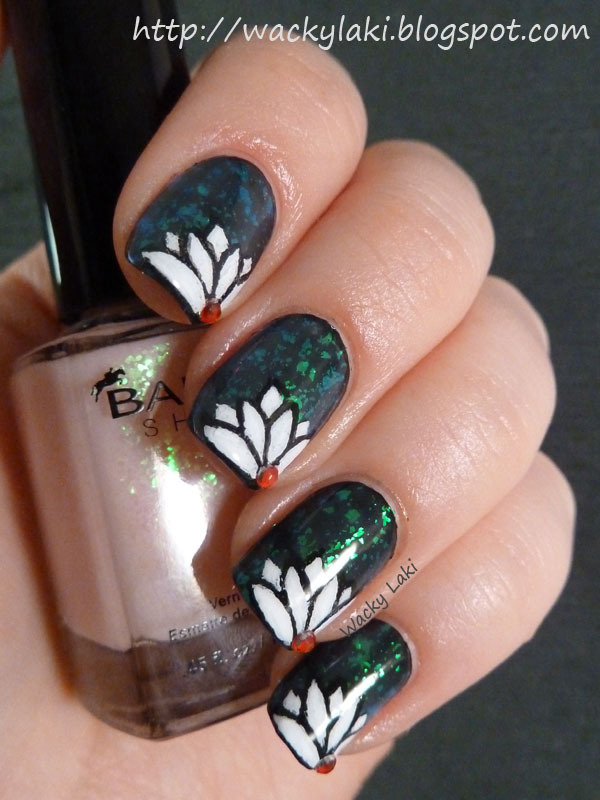 In this case, I'm not convinced that I ended up with lotus flowers, but whatever flower that is, I do love the manicure. 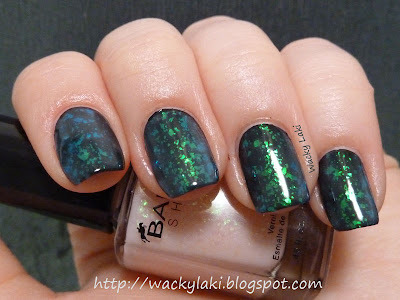 Some swatches of Budda-Ful over Wet 'n Wild Black Creme to show off the gorgeous blue/green flakies. 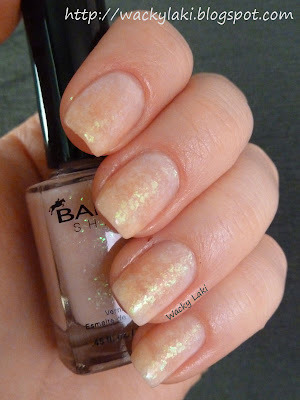 The base of Budda-Ful is quite milky which gives the combo a soft foggy look. Is there anything better than flakies over black? Do you prefer flakies over a light or dark base? Beautiful! Looks like lotus flowers on a pond in the evening. 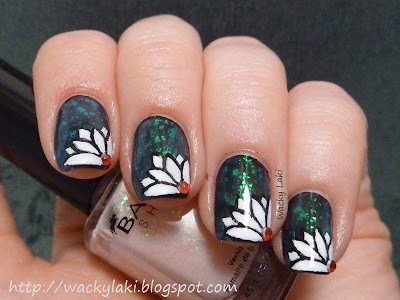 I think they def look like lotus flowers on a pond. You did a great job! 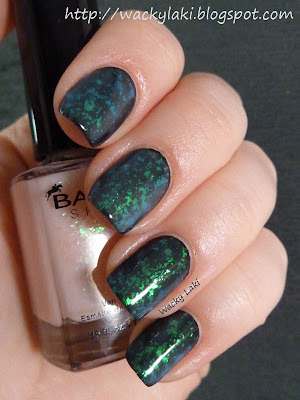 That Barielle polish looks amazing! Love it! Beautiful and reminds me of stained glass design. Such a clever idea, just like a pond! I love your flower. That polish is GORGEOUS!!! Wow! Oooh, I LOVE this! 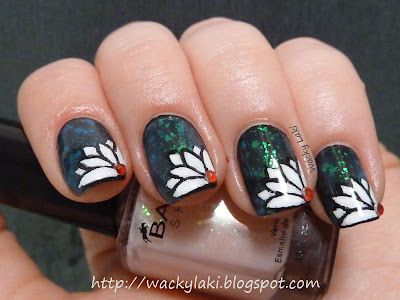 And I think they do look like lotus flowers! So pretty! I love the lotus design! Love love love this! The lotus flower is gorgeous and I'm just a sucker for flakies period! Great post. Thank you! I'm excited to hear that you think they do look like lotus flowers! That is the look I was going for. I did a look inspired by this. Thanks for the inspiration!